James Smith is a member of the Fort Peck Sioux Tribe of Montana and a descendant of the Warm Springs Tribe of Oregon. He graduated from Portland State University with a Master of Science in Financial Analysis and has over 11 years experience in tax and finance, including income tax auditing, corporate tax reporting, and non-profit finance. James is currently a Financial Analyst for Morrison Child & Family Services, and volunteers as Treasurer for the Concerned Indian Community, both of which are local, non-profit organizations. 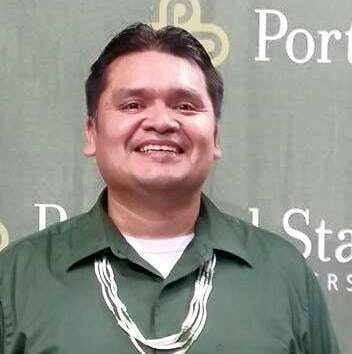 James enjoys spending time with his wife, Theresa, and three children, Sophia, Harry and Dean, who are all enrolled with the Confederated Tribes of Siletz Indians. The family regularly attend and participate in Native American powwows throughout the Northwest. Besides singing Native traditional songs, James also composes inter-tribal songs. He performs with his drum group, Bulls and Bears, at various Native events and has also performed at civic events in the local area, such as the 2016 Portland State University Commencement Services and the 2013 Multnomah County Library, Everybody Reads culminating event.